I hope you are enjoying summer so far-I certainly am! I love having the boys home with no schedule-we are having a great time! I have a freezer full of popsicles, a huge supply of band-aids, a few bottles of sunscreen and a dirty tub...heehee! They are so dirty when they come in at night from running around in bare feet, playing games and remnants of food from whatever they ate that day. So the tub has taken a beating....LOL! So-how do you like the new look of my blog? Pretty schnazzy-right? I learn more and more each time I mess around with it. 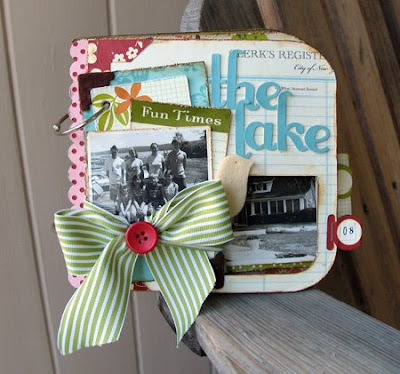 Shabby Blogs is the best-just love their blog accessories-it was so easy! Which, I am all about easy these days. Another bit of news-I am trying out for the Cosmo Cricket DT. 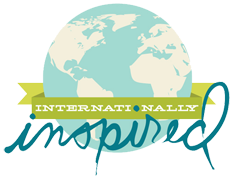 I absolutely LOVE their products! I am very excited to try, even though there will be a ton of other amazingly talented designers trying and there are just a few spots...eeeek! I am just glad I found out about it before the deadline--somehow I've missed it every year. And I just found out about it yesterday! So that alone makes me very happy....They asked that you post your best work on your blog and forward it to them. Easy-no prob! But how do we know what our best is? I just decided that I would post some of my faves and I whipped up a couple of things with the new Early Bird papers they just released. I really tried to post a variety of projects using all kinds of different lines, layout sizes, minis and more. This line from Cosmo Cricket is soooooo fun to work with. I just adore the bright colors mixed with a bit of shabbiness--these are some of my fave color combinations! I was also able to squeeze out a little set of cards. Don't you just love the toaster and tea cup? 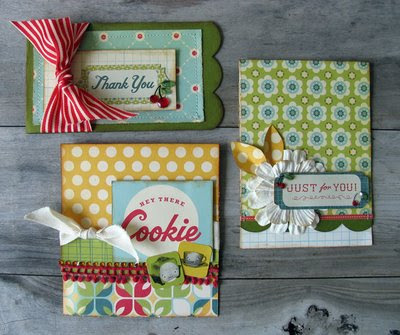 This is a set of cards I created for a stamp event this past spring. I love stamping-I need to do it more often! This is a night light I created for a workshop for Bad Girls last fall. I used a box that my Prima flowers came in and went to town. Kate uses it now--she loves it! This is a mini I recently made. I needed to get a new family mini going with updated photos. It turned out so sweet. I just love this LO of Bry. He just goes and goes! I cut cardstock around the swirls-they really pop on the LO! This is my layout I did for Pencil Lines last year. The sketch was so awesome and I decided to create and 8 1/2 x 11 from it. I did the same trick with the swirls. 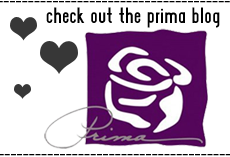 This is a Paintable LO I made for Prima when the clears came out. I painted it with alcohol inks and backed it with Kraft paper. Isn't Josie's daugther so pretty?? 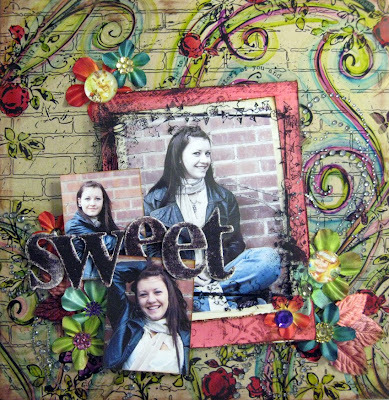 This baby layout is a recent one I did for Prima. Lots of layering and sweetness going on here. This is one of my very faves to date! 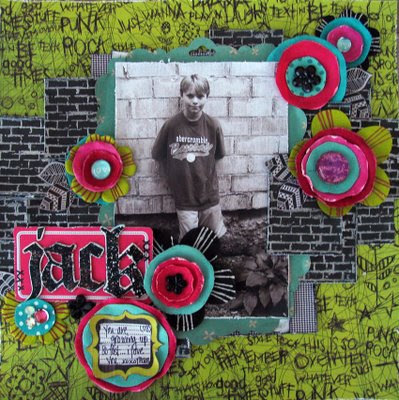 We are in the tween years with Jack. This paper line was perfect for this age. I stamped a brick pattern a bunch of times onto black cardstock and embossed with silver powder. I cut then out into seperate rectangles and layered across the page. This was too fun! Bry looks like such a tough guy on his ride. 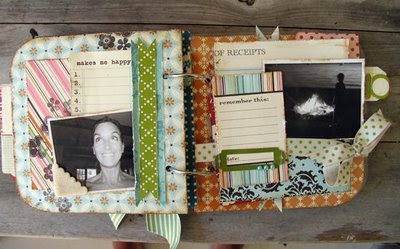 I layered strips of paper with the photos-I just love how it turned out! 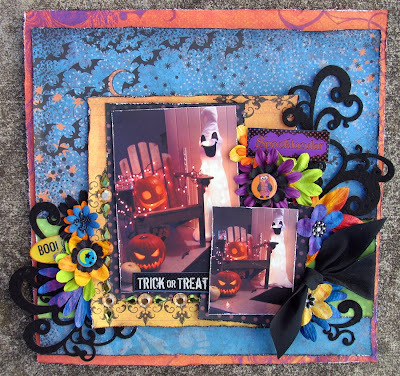 Halloween is one of my fave times of the year-there is no wonder why I love this LO! 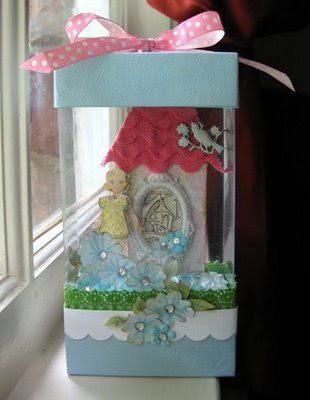 I stamped, used felt embellishments and layered it all with flowers. I would never have thought I would use flowers on a Halloween LO but I did--and it works! And last but not least-the happiest kid on the planet! Having a blast at the beach! The photo is slightly out of focus but I don't care--it still says it all! So-that is it my friends! Do you think I chose enough?LOL!! All of these layouts are fun, bright, and they make me smile. I love them all for different reasons... Thanks for taking the tour with me! Whats all this you ask??? I wanted to pop in and share an amazing class going on over at Bad Girls! 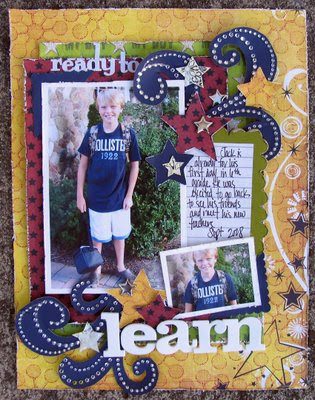 Jen has created a class that shows you how to print photos onto...well-just about anything! Aluminum Foil, Tags, Tapes and more! The results are beyond amazing and it's so cool to learn something new-right? Even though the class was posted already-it will be available for a month so you can purchase the class and check it out at your own leasure. It's also posted in stages which is nice. You can take in a little bit at a time to play and practice as you go. Jen is there to answer any questions or concerns you may have. Class Description:Are you bored with regular photographs on photo paper? Do you long to add more texture and interest to your artwork and pages? This in depth class is for you! 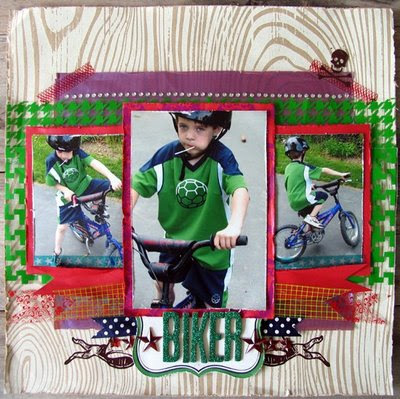 I will show you how to print photographs and images onto alternative surfaces. Basically, any surface that will fit through your printer is free game! I will walk you through from simple photo editing to getting the most effective image from your printer. 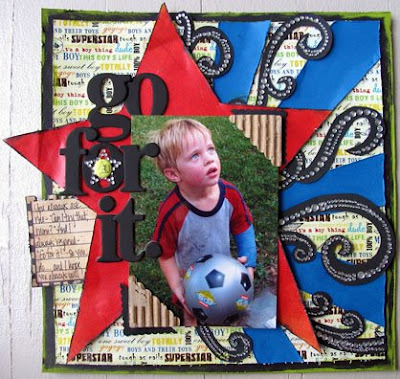 Forget the traditional way of using photographs... this class will have you recycling materials, playing with digital techniques and using media in a whole NEW way!!! I will share my secrets to printing on ribbon, metal, transparencies, and even sandpaper! You will not find this class anywhere else except on Bad Girls! Join me for a fun and addictive technique class! Amazing things you can do with the program!!! I totally need this class! She is so talented and I love that she is sharing it with us! -Class Description:This super simple and fun hands on approach to Photoshop is a great starting point for beginners and intermediate users that want to bring their work to life! I will guide you along using Adobe Elements 7. 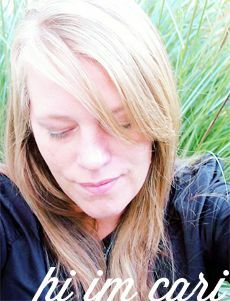 I will share with you some tips and tricks that I use, as well as some of my "secrets" for getting custom color and having it do what you want it to do for the look and feel you are going for! Photoshop is as limitless as your imagination, and this class will open up a whole new world for you. You will learn Color Enhancements, as well as other looks for your photos such as Vintage, Color Splash, Color Wash, Black and White looks. We'll learn about blending modes and layers, as well as a cool trick for working with layer masks in elements that are otherwise only available in higher versions of Photoshop. We will also be making fun banners and blinkies! This Class includes a private forum as well as video instruction and a downloadable .pdf file. 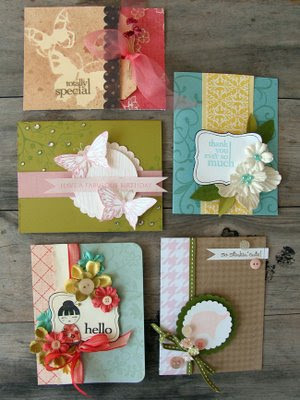 As a special bonus you will have access to some custom downloadable papers and brushes made exclusively for this class! Hope everyone is enjoying the weather and the last weeks of school are here.Our kids are still in school all the way until June25th-can you believe it? Too long I think..I wish I had more time with my kiddos during summer break. sigh...And let me tell you-they are soooo ready to be done! And I am working everyday up until the last day--at the High School. Big news at Bad Girls--they have totally changed the look of the site and the direction of the kits. Wendy has had to scale back a bit, her family was suffering for it and that just can't happen. Her kids need her and she wanted some freedom to spend time with them. She is such a wonderful Mom-I applaud her for taking a step back and making these changes despite the success of her kit club. I added a new gadget at the right-a new Bad Girls blinkie! Click on it and it will take you directly to the new site. It's gorgeous! And the kits are different too. 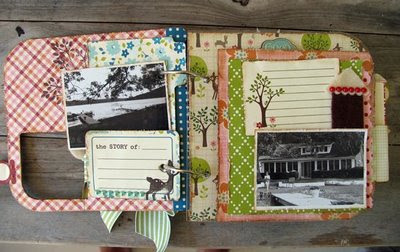 They are chock full of scrap goodness and vintage finds. Her kits are going to be totally different than what you would find in an average kit. There will be elements in the kits that are from Antique shops, art mediums to play with and more! I am really excited to see what is in store for Bad Girls in the coming months! I have been very busy creating some LO's but I can't share them yet--wish I could! So-in the meatime, I'll share some oldies but goodies. 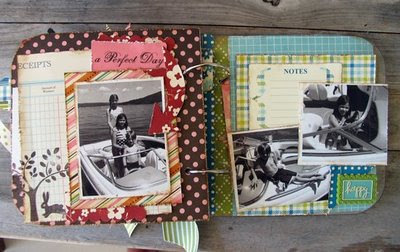 This is a minibook I taught last summer using October Afternoon goodies....And a clear album from TI. 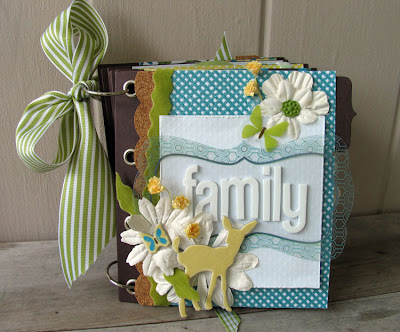 I just love their papers and embellishments! We had a lot of fun during the class too! Thats all for today! Thanks so much for stopping by...I will be back soon!